Origin: Myanmar. 100% handmade carving. In general, the climbing dragon on the tooth represents the dragon tooth. There are a dragon and a tooth. people called fortune and an amulet for evil. The dragon represents auspiciousness and blessings. generally, people use The teeth for evil protection. 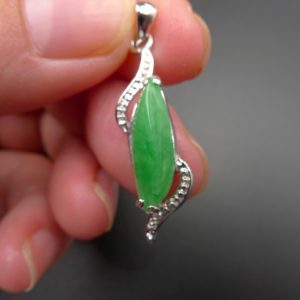 we are Burma jadeite factory outlet store, can accept any order for the jade bangle, jade ring, jade pendant, and some unusual sizes products, items all lifetime grade A untreated Burma jadeite guaranteed, We accept PayPal / MasterCard / Visa / Secure Payments Via Paypal. We have 7 days return policies for products if they are not suitable according to their requirements.